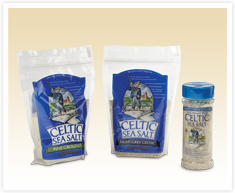 Since 1976, Celtic Sea Salt represents a line of authentic, unprocessed whole salt products hand harvested by paludiers (artisan salt farmers) from one of the most pristine coastal regions of Brittany, France using a farming method that preserves the purity and balance of the ocean minerals naturally found in these salts. These salt products are highly recommended by many health professionals because they help the body to create electrolytes from its naturally occurring minerals and trace elements. Unmatched in flavor, you can be sure that Celtic Sea Salts contain no anti-caking agents, bleaching agents or any other additives.